13.6 nm to the east of WLIS Buoy, 29.8 nm to the west of CLIS Buoy, north of Smithtown Bay, Long Island; in 30 meters (100 feet) of water. Sea-Bird Electronics SMP37 with water temperature, conductivity (salinity), dissolved oxygen. 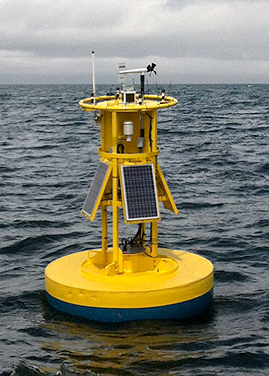 Surface sensor at approximately 1 meter (3 ft) deep; two bottom sensors at 24 meters (79 feet).